I I have been seeing pictures online of these shoes for a few months now; finally they have made it over to the UK. 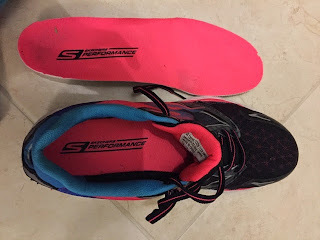 I have to confess that reading reviews I had mixed feelings about some of the changes which had been made but I did love the new look of the new shoe. First impressions out the box was they looked really nice - just like the pictures! The material of the upper is different with a nice two tone kind of pattern at the front then round the back there are several colours - very pretty - the sort of shoe which attracts a lot of admiring glances because they are a little bit different. They come with two sets of laces, some flat two coloured ones (in the picture) like in the gorun ultra and some bright pink ones like in the gorun ride3 - a nice touch to have the choice. 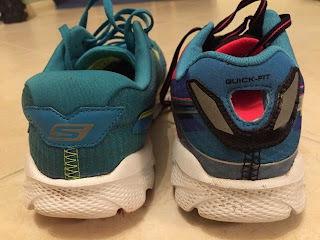 The most obvious difference was the hole in the back of the shoe - I had seen this on photos and was not sure I liked it as I wondered if it might be a bit annoying/ cause chaffing issues. I have found it is OK and actually quite helpful when pulling the shoes on and off - the purpose was to enable triathletes to have a quick transition. Whilst on the topic of the heel the fit is a bit more snug and the shoe comes higher up. A few times On my long run I found it a little annoying but it has not caused problems, if it does I will just attack it with some scissors!! The shoes come with removable insoles so you can wear without if you want a more minimal/lighter feel. 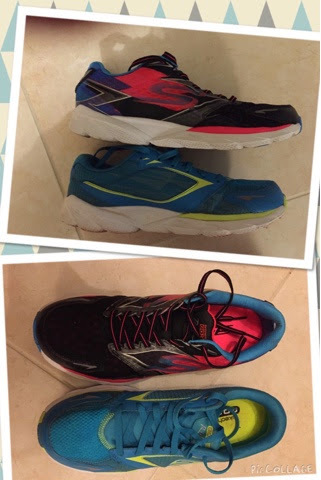 I have only worn the shoes with the insoles; if I want a lighter shoe then I wear the Gorun3. I tried them on without insoles; they felt comfortable. 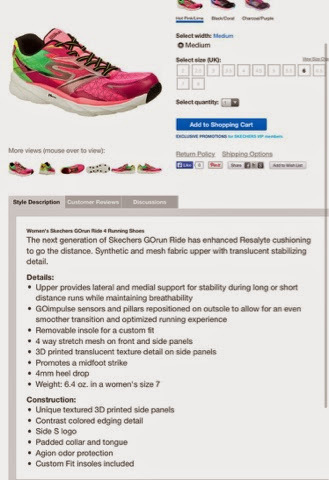 My size 7 weigh 224g with insoles which is 10g more than the Gorunride3. Like the previous versions they are very comfortable to run in with a smooth ride. The flexibility remains good and for the weight there is a surprising amount of cushioning (I use the rides for 24 hour races). 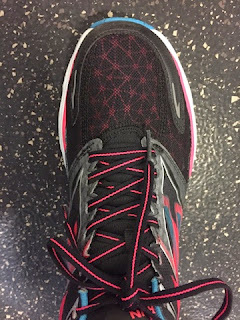 This new version feels a little firmer and perhaps a little more supportive than previous models - I am not talking over pronation support here they are still a neutral shoe. 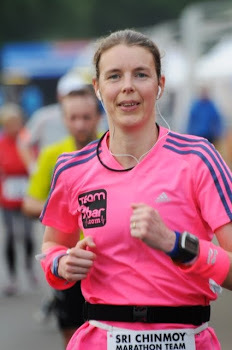 I know some people who like the rides but don't feel they offer quite enough support for running as they are very light but they like to use them for walking or the gym. This new version does seem to offer a little more, without taking away the good qualities of the previous versions so will probably appeal to a slightly bigger audience. 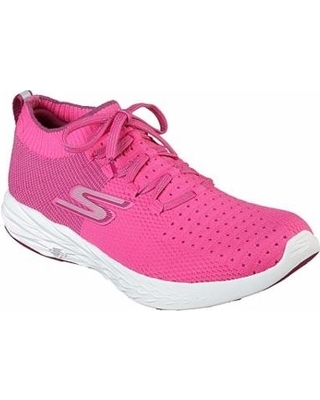 Like all Skechers running shoes these have the M strike technology which encouraged (but doesn't force) a mid foot landing. Since wearing Skechers I have transitioned from being someone who had a very prounouced heel strike on race photos to mostly midfoot landing. 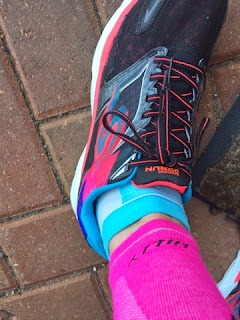 It is probably too early to say as I have only had these about a week but at this point in time I would say on looks I love them and the funky colour scheme they are the best so far - the new gorun4 and gorunultra2 are out soon and they also look fab. In terms of feel/performance I think that I prefer the earlier models but only very marginally due to 1. The heel being a bit higher (which I will probably get used to in time) and 2. The extra support/firmness which is not a bad thing and which for some will be a positive; again it is probably more a case of being used to the earlier models so the new one feels slightly strange. ﻿﻿﻿﻿I don't think the changes are so massive that if you are in love with the ride3 you feel you have to stock up on the 3's before they run out. However, the changes are subtle enough to be an improvement for those who didn't feel the 3 was quite supportive enough to run in. Even if you don't like the 4's as much to run in they are the best looking shoe so will look good at the gym!